Randolph has subscribed to the audio book service Tales2Go. Simply download the free Tales2Go app on your mobile phone or tablet. When prompted, select "login as school", then enter your lunch number as your ID and the password "raiders". Select an audio-book and enjoy! 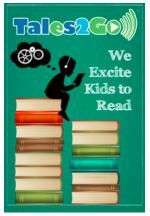 BiblioNasium is a reading social platform for learners ages six to twelve. Students, teachers, and parents all have their own login on the site. Watch the video to learn more. BiblioNasium - Website Tour from Coach Manzee on Vimeo.